By the time they get to the third grade, eight out of 10 children who grow up in low-income households cannot read at grade-level. In Delaware County, half the households are poor. In Muncie, it’s six out of 10. 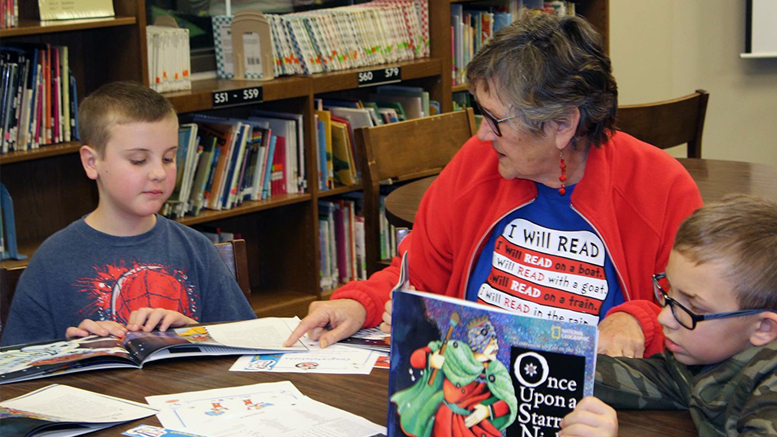 “Reading is everything,” says Nancy Carlson, a retired Ball State University journalist, who for the last two years has volunteered every Thursday afternoon at South View Elementary School to read to third graders. Miss Nancy, as children in her Reading Club know her, has a message to anyone wondering whether what she’s doing is making a difference or whether a donation or volunteer time will really move the needle. Carlson, who has earned a reputation for taking on some of the hardest children to reach, attributes a lack of adult interaction to what may be long-lasting damage. But hope comes in the responses of the children themselves. She tells the story of a student who wanted to know where the city his grandmother lived – in Marion – really is. Carlson brought in a map. Carlson sees further promise in consistency. Reading Club takes place in hallways of the schools. Readers and their children line the hallways, backs up against cinder-block, heads in books, reading. Besides South View, Reading Clubs are in Grissom and Longfellow elementary schools. Generally, adults are not permitted alone with children in classrooms. It’s a matter of safety and one Carlson fully endorses. But on this day, “Frankie” was distracted in the hallway and he spotted a vacant classroom.